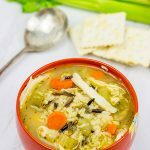 Chicken Pot Pie Soup - Turn a classic winter comfort food into soup! Light a fire. Put on your favorite pajamas. 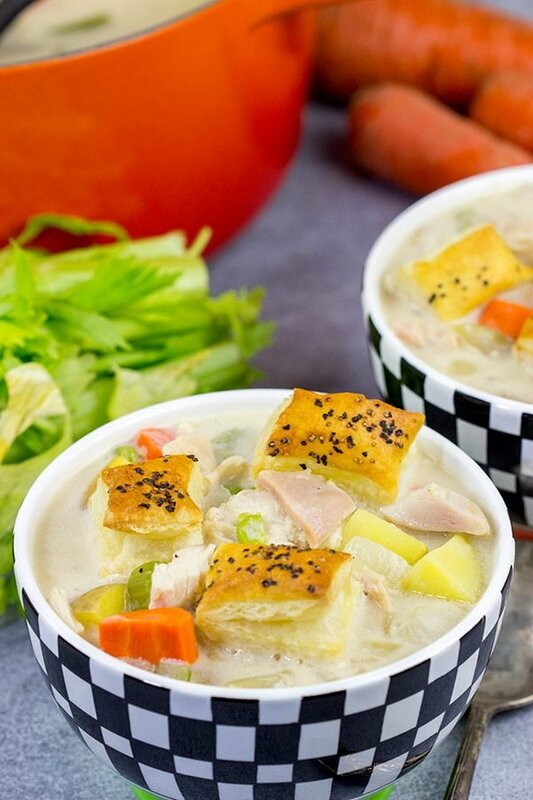 And then curl up with a bowl of this Chicken Pot Pie Soup! Stop and picture this. (Or just look outside of your window…) It’s a cold winter day. There’s a roaring fire in the fireplace. There’s a pot of this Chicken Pot Pie Soup simmering on the stovetop. What are you wearing? (Hear me out. This isn’t some cheap, romance novel. I have a point here!) For me, that scene just calls, nay, screams, for footie pajamas. Yes, footie pajamas. There I said it. I’m a grown man, and I absolutely love my footie pajamas. I also love powdered sugar doughnuts and Scooby Doo…so really that just makes me a kid in a grown-up’s body. Every year since Robbie was born, my sister sends us matching pairs of pajamas for Christmas. I’m not gonna lie…those pajamas are one of my favorite presents! I know little kids groan about finding socks or a knitted sweater from Grandma under the tree. Not me! I look forward to opening those pajamas. A couple years ago, it was these matching moose-themed pajamas…with a flapjack on the back! And it didn’t stop there. These PJ’s had “Don’t Moose With Me” printed on the back flapjack. I laughed hysterically when I opened those up, and then I promptly put ’em on. And I wore ’em all winter. Robbie has outgrown his version, but I still wear mine quite often. If it’s a snowy day where we know we aren’t going out, I just wear those PJ’s all day! Oh, and I may or may not have these Grinch pajamas, too. I think I have a pajama problem. But switching gears away from warm winter clothes, let’s talk about warm winter comfort food. More specifically, let’s talk about this Chicken Pot Pie Soup! Now I love a good chicken pot pie. In fact, it’s one of my favorite winter meals. But sometimes you just need soup, right? So I took my go-to chicken pot pie recipe and adapted it slightly to turn it into a soup. 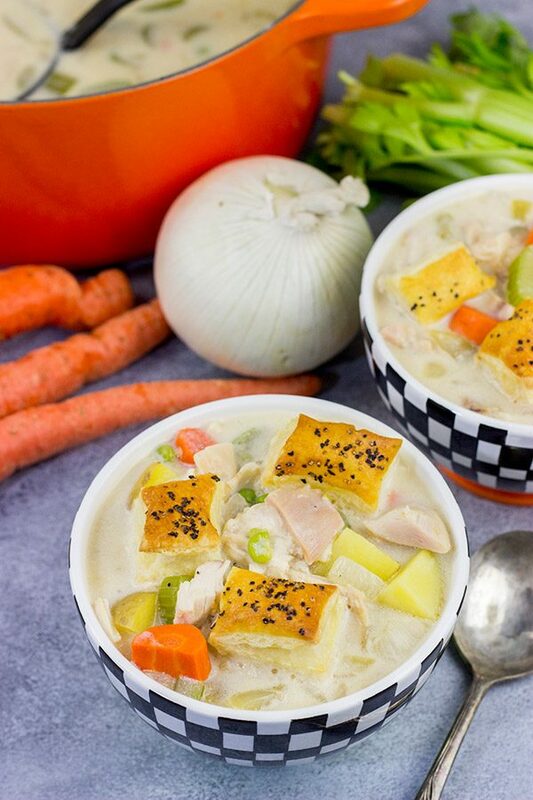 The result is this Chicken Pot Pie Soup, and it’s a guaranteed way to warm up on a cold winter day (especially if you’re wearing footie pajamas, too). 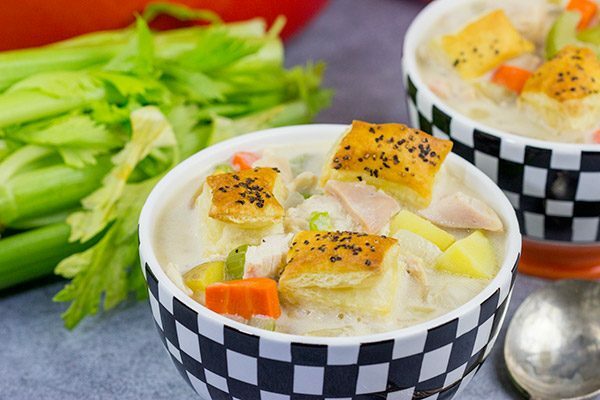 There are a couple of tricks to this chicken pot pie soup. First, the flour. 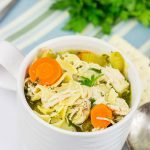 I know it might seem strange to mix flour into soup, but this little addition aligns the flavors of this soup with the flavors of a traditional chicken pot pie. Second, the half-and-half. You need to add a bit of creaminess to this soup to mimic the traditional pot pie flavors, and the half-and-half does it. 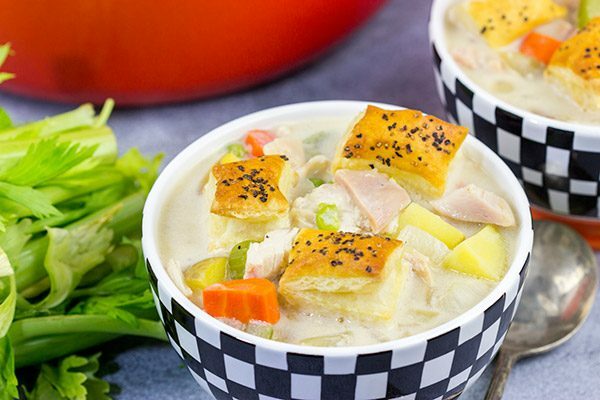 The creaminess is essential for making this Chicken Pot Pie Soup taste like a pot pie. Oh, and last but not least, the puff pastry croutons. I wasn’t sure how to incorporate the pie crust topping given that this soup would be divided into bowls. Then it hit me. What if I used puff pastry to make “croutons” for the top of the soup? Easy! And let me tell ya, the bottoms of those puff pastry squares soak up a bit of liquid from the soup…and they’re delicious! 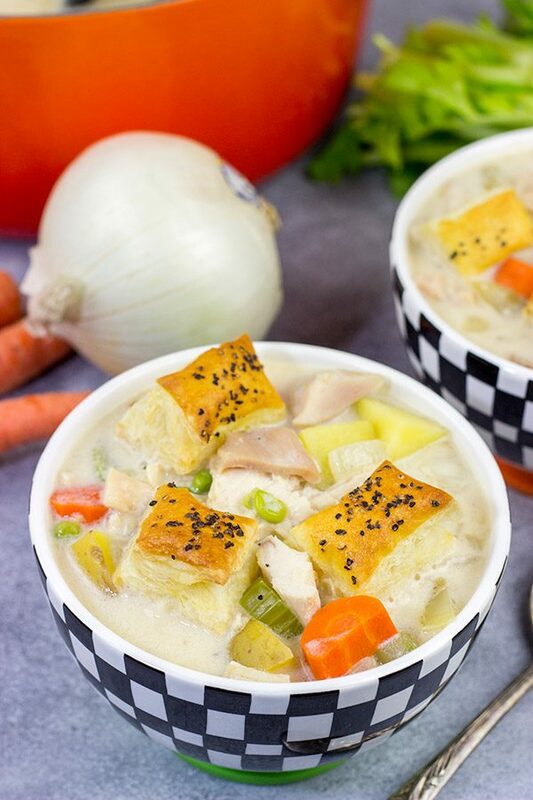 If you’re looking for one heck of a delicious soup for these cold winter days, then this Chicken Pot Pie Soup is the way to go. If you make this soup, swing back by and leave a comment. Or snap a photo of your creation and tag me on Instagram (@Spicedblog). Stay warm, my friends! 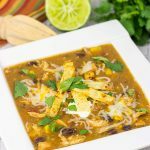 Looking for more tasty soups? Check out these other favorites! Meanwhile, cut the puff pastry into 1”x1” squares and place on a parchment-lined baking pan. Brush tops of puff pastry squares with beaten egg. (Optional: Sprinkle tops of puff pastry squares with a bit of black pepper.) Bake at 400°F for 14-16 minutes, or until golden brown. Remove from oven and set aside. Meanwhile, using a medium saucepan, fill half full with water. Place over high heat and bring to a boil. Add the potatoes, carrots, peas, celery, and corn; cook for 12-14 minutes or until potatoes are tender. Remove from heat and drain. Transfer vegetables into a large bowl; add cooked chicken and stir until well combined. Set aside. Using a large stockpot or Dutch oven, add the butter and place over medium heat. Once butter has melted, add onions and garlic. Sauté, stirring occasionally, until onions begin to turn translucent (about 6-8 minutes). Add flour, salt, pepper, chicken stock, water and half-and-half; stir until well combined. Cook over medium heat, stirring often, until mixture begins to boil. Add vegetables/chicken and stir until well combined; remove from heat. Divide soup into bowl and top with puff pastry ‘croutons’ before serving. If you don’t feel like cooking the chicken in advance, use a rotisserie chicken! I think your secret is safe with me, Kelsie. I’m pretty sure the whole world isn’t reading my blog (although that would be pretty cool, right?)! And I say you should totally get matching PJs with Cookie. If it makes you happy, do it! That’s my mantra. 🙂 Oh, and extra croutons on this chicken pot pie soup are a must! I’ll take a bowl of soup with 2 orders of croutons please! Chicken Pot Pie was one of my favorites as a kid. But I haven’t had it for years. Great idea to turn it into a soup! Oh man, this soup is so tasty, Frank! It’s the very definition of winter comfort food. Also, I really should post a photo of us in our matching PJs. The only problem is that they’re Christmas themed…so it doesn’t really make sense for February! Great post. Great soup. You’re a great storyteller. Oh weather. I’ve said on several occasions that it’s been relatively mild winter in Nova Scotia… Disregard this today. I’ve jinxed this. As I work in provincial government, we expected a closure would be announced…and it was for most public sector but not for us. While the morning walk wasn’t too bad (Just snow blowing into your face), it has now changed to ice pellets, and freezing rain expected by the time I’ll go home (Wish me luck. It’s probably a good time to learn some skating…or curling basics bhaha). I certainly wouldn’t mind my pajamas, warm socks, and a bowl of this delicious soup right now. So comforting! Oh man, that weather sounds rough up there, Ben. My curling teammates all work for a government research lab here in the area, and their workplace never closes. Ever. The poor guys have to go into work in the worst of weather! But that’s where this chicken pot pie soup comes in. You just need to curl up on the couch with a bowl and forget about the white stuff outside! Heck yeah to footie PJ’s! Not only are they a throwback to my childhood, but they’re just awesome. I’ve been known to wear my footie PJ’s all winter long…even if they are Christmas themed. 🙂 I say plan a footie PJ and chicken pot pie soup day this Saturday. And then repeat it on Sunday. Maybe with a little Mario mixed in for good measure! Cheers, my friend! It’s pouring rain 🌧 and it is cold for California standards. We even had some snow on the peak of our coastal mountains. But I am not complaining, we need the rain. Your soup looks delicious, stay warm and cozy in your pajamas. Umph. It might not be snowing in your area, but a cold rain still requires a good bowl of soup! I say make a chicken pot pie and pajama day this weekend sometime. It does sound like a good idea, right?? 🙂 Thanks so much, Gerlinde, and Happy Valentine’s Day, my friend! Hey, don’t knock those footie PJ’s until you’ve tried ’em, Kathy. They’re pretty awesome! Nothing beats curling up on the couch in footie PJ’s with a bowl of soup. 🙂 Cheers, my friend, and Happy Valentine’s Day! I love a good chunky soup! I mean I love smooth soups, too, but a chunky soup makes it feel like you’re actually eating a meal, ya know? I’m ok with the central radiator as long as you wear those Superman pj’s. Haha! Thanks, Neil! Love that have footie pajamas, and you own it! 🙂 Sounds comfy! I might just need a pair. I miss the days that’s all my boys would wear. Teenagers aren’t so into them I guess. 😉 On to the soup. Brilliant! I love a good chicken pot pie, so I know I would devour this. The puff pastry croutons are the perfect way to go here! Oh man, I totally own those footie pj’s, Valentina! They’re amazing. The only problem is you have to wear them on a day when you know you won’t be leaving the house. Otherwise you might get some strange looks. 🙂 Order yourself a pair of footie pj’s and make a batch of soup. Sounds like a pretty awesome day to me! Scooby-Dooby-Doo, that’s some good looking Chicken Pot Pie soup you got there. The perfect lunch for a “Mystery Incorporated” meeting. Oh boy, those croutons would sure make good Scooby snacks! Sorry, David, I couldn’t help myself. Footie pajamas? I love it! Honestly, I’m just as happy with Chicken Pot Pie Soup as I am with the full fledged crust version and yours looks just perfect! Somewhere in our family trees, there must be a common node. I have a serious collection of pajamas. I cannot wait to get home from work, and change into them. No footies, though – I draw that line. 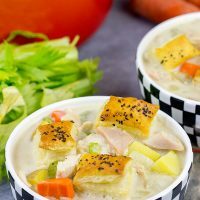 Your chicken pot pie soup looks delicious, but – as much as I love chicken soup – eating chicken pot pie for me is just an excuse to dunk pastry into a thick, creamy, chicken gravy. So, I think that what I’ll do it make your puff pastry croutons, fill a big bowl with them, and drizzle on some soup! Yup, we need to dig back in that family tree, Jeff. I think there’s a similar branch somewhere back there for sure! But you draw the line at footie pj’s? I respect your decision, but I must ask – when was the last time you tried footie pj’s? If you can’t answer that one quickly, then I challenge you to try them again. Also, I think your idea of a bowl of puff pastry croutons sounds pretty awesome. Let’s make that happen! The soup sounds fantastic! Do you think I can freeze it even if it has 1/2 and 1/2 in it? Hey Paula! That’s a great question. I’ve never tried freezing this soup, so I couldn’t say definitively here. My gut feeling is to avoid freezing this one since the half-and-half could separate. Instead, I might recommend dividing out the freezer portion and freezing it without the half-and-half. Then just add it in once you reheat that freezer portion later. (Just make sure to do the math and hold back the appropriate amount of half-and-half, too.) I hope this makes sense! If you try freezing this soup, will you swing back by later and let me know how it works?? Thanks in advance, and I hope you enjoy this soup as much as we do!